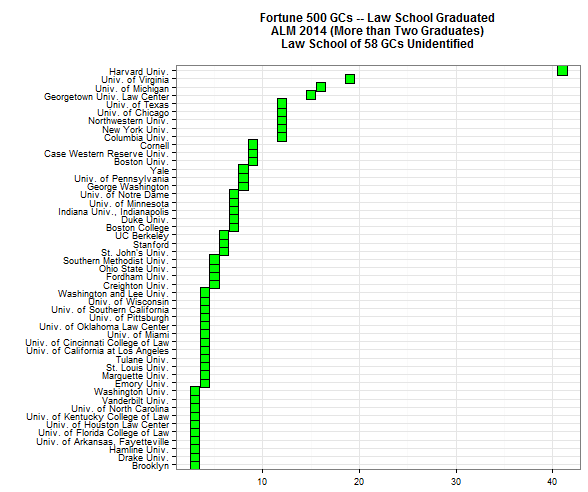 Home > Talent > Which law schools have graduated the most Fortune 500 general counsel? Which law schools have graduated the most Fortune 500 general counsel? ALM publishes data about the Fortune 500 companies and their chief legal officers. One of the pieces of information is the law school from which the CLO graduated. Firing up my trusty software for data analysis, I looked at the distribution of those graduates. The plot below shows how many of that select group of general counsel graduated from each law school where the school had at least two graduates. Thus, the eight schools at the bottom left claim three graduates each. Sixty-eight law schools (out of a total of 117 different schools) had a single graduate or two graduates. I left them out because the graph becomes much harder to read with so many schools on the left axis. By the way, at least two of them are not U.S. law schools! Having sorted the schools by increasing numbers of GC-graduates, it is clear that primus inter pares, by far, is Harvard Law School. Virginia (19), Michigan (16), and Georgetown (15) trail by quite a bit.